Women love unconditionally and struggle with all obstacles that need in order to eventually feel the happiness in a relationship. However, when a woman decides that it is not worth anymore, and she needs to leave, there is nothing that can stop her. Even when being mistreated, women fight and are determined to save love and get the most out of their relationship. If you have found the one already, make sure you treat her right, show her how much you care, and respect her. Both partners are needed for a relationship to succeed, and if she struggles alone, it won’t take long for her to realize that leaving is the only option. If the man is not present, physically and emotionally, in the relationship, there is no point in being a couple anymore. A woman does not need the man to be available at her every beck and call, but she needs to know that she has his support and love at all times. The best gift you can give to a woman is to love her, and she will reciprocate it and treat you even better. A faithful woman will cherish your feelings, and stay with you, in good and bad in life. Your woman will walk out if she does not receive a thing, even though she has exhausted all her strength to make the relationship work. She will eventually decide it is best to leave if it outweighs remaining together. Women are well aware of their self-worth, so when not treated as they deserve, they will end the relationship. Women feel the need to grow, learn, love and be loved, and if their partner does not appreciate them, they will decide to turn to their own happiness, instead of constantly seeking the attention they need. When she has tried her best and the relationship is still toxic and she doesn’t feel happy, she won’t stay anymore. 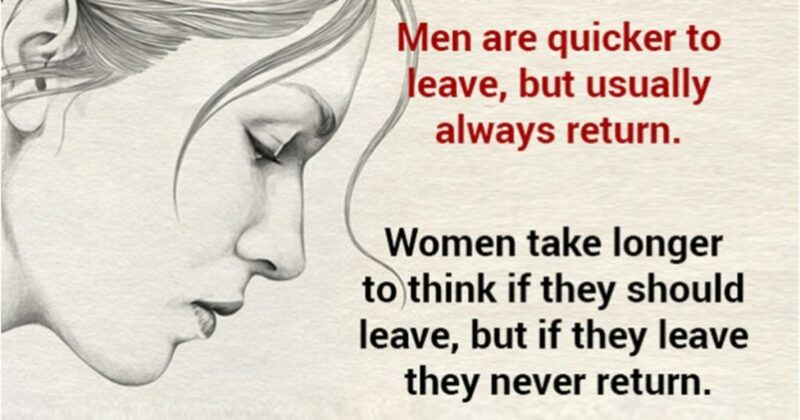 Even when hard, women leave if they believe they are not needed or loved.